Yesterday the weather was absolutely beautiful, partly sunny, and temperatures in the low 70's. Last night at sunset it still looked promising for a good day today. This morning we awoke to a gray overcast sky, and a little bit of light rain. Not nearly as good as yesterday, but still, not a bad day for a pistol match, by golly! 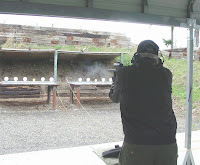 If you are unfamiliar with the Rimfire Falling Plate matches, scroll down the page two posts and there's lots of background info and pictures to get you up to speed. 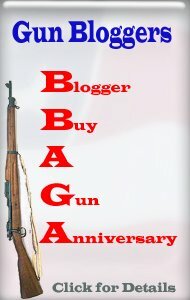 Larry is an old friend and retired gunsmith who lives a few miles from us. Larry and I had put together a Browning Buckmark and Red Dot combo for him this last week, and he hadn't had much of a chance to figure out how you shoot with a red dot sight yet. We'd fix that today! Larry is 89 years young, and he shot well for his first time out with a new setup. LarryW gets his first shot off. We had a some of shooters visiting from the Custer club, since their range is still flooded, so we had a good turnout of 23 shooters. Not bad at all for a small club like CWSA. "Evil Al" was the match coordinator, and he split the shooters into two groups. 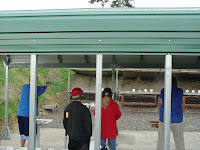 Each group would shoot against each member of their own group for three tables. After both round robin's had been completed, the top scoring shooter from each group would shoot against each other, 3 out of 5 table, to determine the match winner. The second highest scorer from each group would shoot it out, again 3 out of 5, to determine 3rd and 4th place. Brandy has a one plate lead. With the round robin format, you get in a whole lot of shooting, and you are shooting every few minutes, all day long. Each shooter shot head to head against another shooters at least thirty times, and our group had one more shooter, so we all got thirty three tables. That's quite a bit of shooting, and several shooters figured they each had used close to 300 rounds of ammunition. As I watched the individual matches go by, it was really apparent just how closely matched all of the shooters were. There were lots and lots of really close tables, often with only a plate or less difference between the winner and the loser. The bugaboo of shooting the stop plate early bit a few shooters, too. It's really hard to shoot three plates in a row, then skip over one, shoot the remaining two, then come back for the stop plate. The temptation to pull the trigger when you see the stop plate pass in front of your sight is tough to overcome! By early afternoon the round robin rotations had been completed, and the score cards were turned in and added up. Evil Al had the best score in group one, with Kim from Custer second. I had the best score out of group two, with Tony the Kid in second. KeeWee had shot well all day, and was easily in the top third overall, but the final results haven't been posted yet. Larry was a bit rusty, not having done any competitive shooting in quite a while, but he did well for his first try at falling plates, and more importantly, he had a whole lot of fun, which is what it's all about! New shooter MikeF shot exceptionally well, well up in the standings overall, and Wayne, Mike's dad, also shot very respectably, particularly considering he's also a new shooter. Once again it was Al and I, head to head. This time, three out of five for the match. Al shoots a well set up Smith and Wesson model 41, and I was shooting my Volquartsen barreled High Standard Supermatic Citation. I knew that I couldn't shoot much faster, so I concentrated on trying to do another run the same, and hope for the best. If Al keeps shooting like his first table, no one's going to beat him today! The second run I narrowly managed a win, but it was close. The third table Al got bit by the stop plate bug. When you are shooting as fast as you can you really don't have the time to see if you hit all of the plates, at least the last couple of them, you just assume you did, and shoot the stop plate with your sixth shot. There's a magic thing that happens when you are shooting in competition, and I suspect there's something similar in most competitive sports. You get into a "zone" and it's almost like you become a spectator, watching the match through your red dot sight. 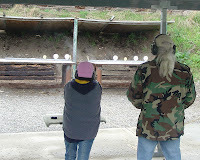 When the dot appears over a plate, the gun magically fires all by itself, all you have to do is watch it as it happens! My last run was one of those magic runs. The horn went off, the red dot magically leaped from plate to plate, and the High Standard went off at exactly the right time. Six shots, six plates, and the match was over. I was so full of adrenalin my heart was pounding like a bass drum! It was an amazing, and somehow humbling experience. Words really fail me in describing just how it felt, but it was incredible. Tony and Kim has another battle royal for third place. Kim won two, Tony won two, and Kim took the fifth and deciding table for third place. Al and I have had some wonderful match ups, and this was no exception. I had managed the win today, but it's usually the other way around. It doesn't get any better than that! After helping to sweep up the brass, (we figure close to 7,000 rounds! ), we packed everything back into the van and KeeWee and I took Larry to the Tyee Restaurant in Coupeville for three plates of beer battered halibut and chips. It was excellent! After a great late lunch, we headed home. ........ then I took a nap. I was bushed! KeeWee's post on the match is HERE. Mad Gun's post on the match is HERE.